KENNETT SQUARE, PA. — Portabella, cremini and shiitake mushrooms star in a range of snack products debuting from South Mill Champs, one of North America’s largest mushroom growers. 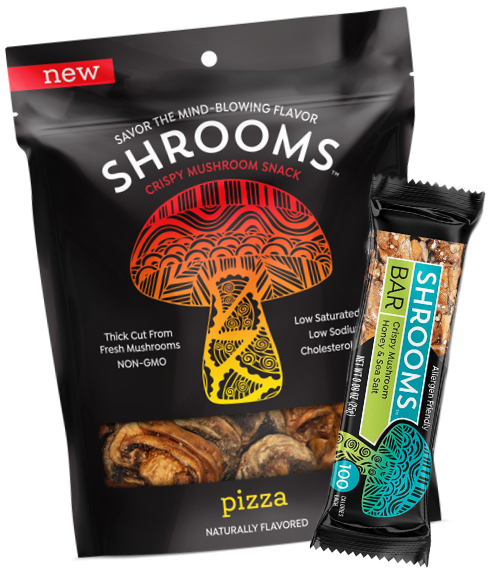 The new brand, Shrooms Snacks, was launched to tap into the popularity of plant-based snacking, said David Eberwein, director of innovation and business development. Mushrooms have captured more mainstream attention recently, as restaurant operators, including Sonic Drive-In, sling blended burgers (that is, beef blended with mushrooms). Varieties such as reishi, cordyceps, chaga and lion’s main are bubbling up in bottled beverages and mixes for coffee and tea. Whole Foods Market listed mushrooms in its 2018 trends forecast, noting, “The rich flavors also lend themselves to mushroom broths, while the earthy, creamy notes pair well with cocoa, chocolate or coffee flavors.” Championed as a functional superfood, mushrooms are rich in vitamins B and D, selenium, potassium, zinc, copper and fiber. Shrooms Snacks is launching four product lines, which are Non-GMO Project verified and free of dairy and tree nuts. Most of the products are gluten-free, vegan and kosher. Shrooms Crispy Mushrooms feature thick-cut mushrooms with a crunchy, crispy texture in flavor varieties such as sea salt, spicy jalapeño, mesquite barbecue, pizza and original. A line of Shrooms Mushroom Jerky is made from marinated, meaty mushroom caps and includes honey chipotle shiitake, roasted teriyaki portabella and original portabella. Shrooms Splits Jerky combines portabella mushroom jerky with fruit, beef jerky or terky jerky. Varieties include Beries + Portabella, Filet Mignon + Portabella, Peppered Beef + Teriyaki and Turkey + Portabella. Shrooms Snack Bars feature crispy white and cremini mushrooms with ingredients such as pumpkin and sunflower seeds, roasted chickpeas, puffed quinoa and flaxseed. Flavors include chocolate chunk, sweet and savory, honey and sea salt, and wild berry and sea salt.